Borno governor celebrates best JAMB candidate for 2018 UTME. 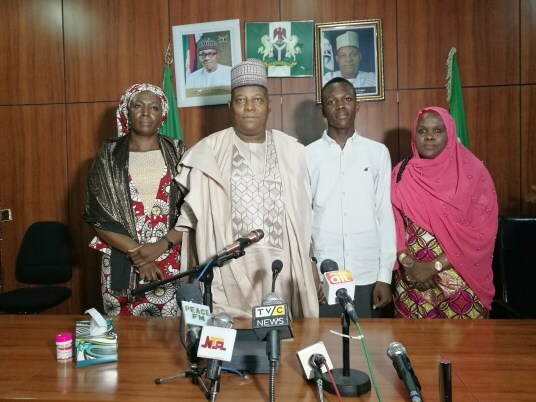 It was moment of celebration at the council chambers of the Borno State government house when the governor, Kashim Shettima, hosted an indigene, Israel Zakari, who emerged the best candidate at the Joint Admission and Matriculation Board (JAMB) exams. Israel and his mother, Jummai Zakari, were ushered into the council chambers where the governor offered a seat to the young man he called ”King of JAMB”. Israel scored 364 marks to emerge the best. 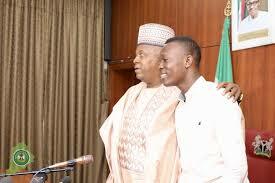 Mr Shettima said his attention was drawn to Israel’s achievement by a friend of the boy’s family via a text message. He said he immediately directed the person to contact the Zakari’s and invited them to visit him in his office in Maiduguri. According to him, the young man who also did well in his WAEC is an ‘Albert Einstein’ of his time. He said Israel’s performance has proven to the world that the people of Borno State are ”not known for the Boko Haram conflict alone; but also in academic and scholarly excellence”. “I am fixating on his achievement because it has also put me particularly in the spotlight. An orphan, raised by a single mother a son of Boko Haram-ravaged Borno who triumphed against all odds. “He has proven to the world that where there is will, there is a way; he has proven to us that adversity should not lock us down; adversity should bring out the best in people. We have to identify with this young man; we have to identify with the boy and his family, fundamentally for two reasons; we must avoid the tyranny of the majority. I am a Kanuri man and a Muslim; this young man, is a Bura-man and a Christian – but above all he is a son of Borno. We must at all times have the generosity of courage and magnanimity to be inclusive. “I am an advocate of inclusivity, I am an advocate of tolerance and accommodation. This is the fundamental reason we invited the Zakaris so that we can all come together and celebrate this young man who is a symbol of excellence, resilience against all odds, so that any young man from Borno can be inspired. “Incidentally the young man has secured an admission into Covenant University and the Borno State Government would want to take full responsibility for his full scholarship. I am in the last lap of my time in office as a governor, so I want to pay the full five years scholarship for him; even though who ever that would succeed will sustain whatever commitment we have made, but I felt that when opportunity beckons like this one should utilise it optimally. So to keep the mind of his mother at rest, we are going to pay the full package of his scholarship now. “The full five years scholarship include the cost of books, cost of living in the campus, and all other related expenses. While we are giving you the offer letter today, the commissioner for higher education will hand you a cheque of N5 million naira which covers all that he needs to study electrical engineering at the Covenant University till graduation. “And I want you the mother to make the payment upfront so that this will not be affected by any kind of inflation. In a voice drenched with emotion, Mrs Zakari thanked the governor and the government of Borno State. “We are honored and I am honored and so lucky for this kind of benevolence,” she said.